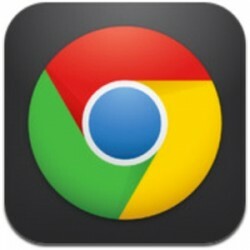 Google has updated its Chrome app to version 28, adding improved "interoperability with other Google Apps," which means links to YouTube, Maps, Google+, and Drive can now be opened in their respective apps rather than in the browser. According to Google, additional app integration will be added in the near future. With version 28 of Chrome, Google introduces a new feature that is designed to speed up page load times and reduce overall data usage, which is being sent out to users on a rolling basis. The update also includes improvements to voice search, fullscreen capabilities on the iPad, access to browser history, and bug fixes. - Interoperability with other Google Apps. Option to open links for YouTube, Maps, G+ and Drive in the app instead of the browser. - Enhancements to voice search. Text-to-speech for all variations of English, Spanish, German, Italian, French, Japanese, and Korean. Toolbar controls are always available when using voice search. - Data cost savings: Reduce data usage and speed up page load times. View data savings in Bandwidth Management settings. This feature is being rolled out and will be available to all users over time. - Access to browser history. - Stability / security improvements and bug fixes. I was really waiting for this one. How about that official Music All Access app we're waiting for? One thing I like about google is how they offer their services to anyone. Look at all the google apps for iOS - imagine if apple were the same way. There would be iWork, iLife, and Safari apps for android with cross platform iCloud sync. They make 95% of their revenue from advertising. Apple does not. They offer these apps to iOS to monetize the users there, they aren't benevolent. If I use Google products, I'd still like true integration with iOS, i.e. clicking on a google map link in Safari opening Apple Maps, instead of webapp. it's a petty comment but the chrome and drive icons don't match the cleanliness of the standard google app and google maps for example. they just took their standard icons and slapped them on black backgrounds with a gradient instead of actually designing something that fits the look/shape of the icon. it's just lazy designing on their part and leaves me a bit miffed. You can easily leave them to open in browser, as is the default case. That's still more options/control than Apple's app provide. who uses chrome anyways, safari is way better, safari is deeply integrated, chrome will never be able to achieve that. Wrong thread, but yes, that's definitely a plus, and something Google needed to address for their iOS app once Apple got that feature. That's definitely my bad, had both threads opened and mistakenly posted in the wrong one.